Explode Facebook by Over 1000%! 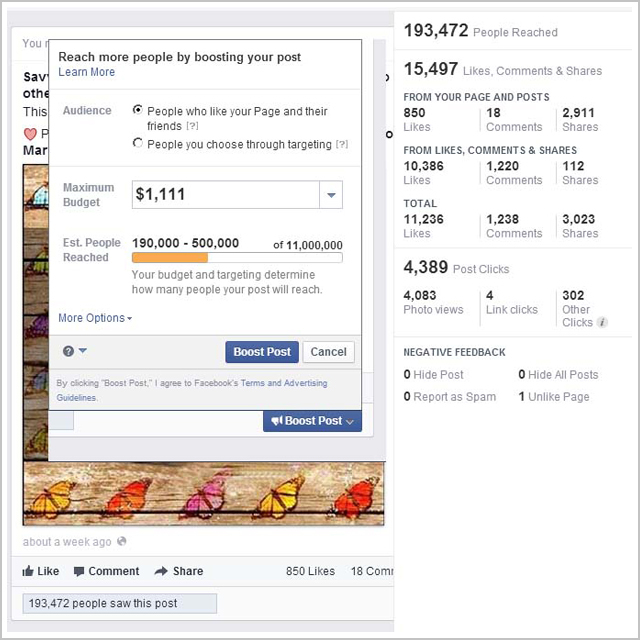 What Is a Facebook Growth Strategy Valuable to You? Are you frustrated by the current lack of engagement on your page? Would you like to build a larger list? Do you have an email list that you currently market to? Would you benefit from the instant credibility of a 10,000+ fan page? Would you like to see all this happen in the background while you work on the parts of your business that you're passionate about? Stature - It's the first thing people check out about you. When people come to your website, your LinkedIn profile or your personal Facebook page they will often take a quick look to see if you have a Facebook Fan page and how popular and active it is. This is because it's one of the fastest ways to see if people are truly connected to the message that you share. 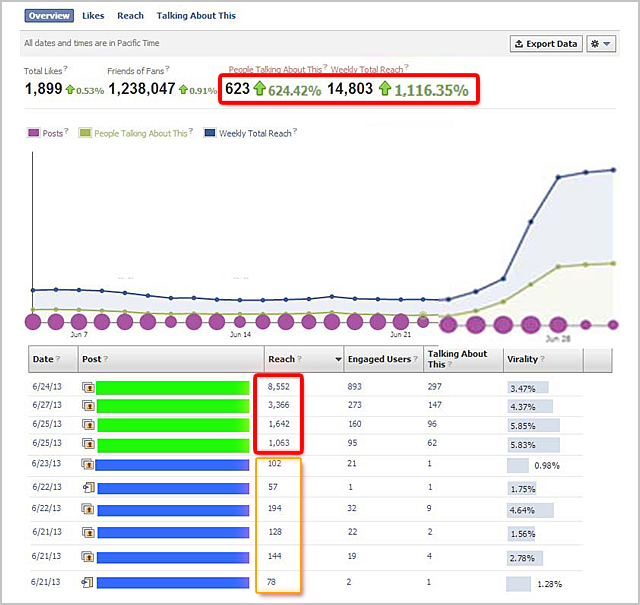 Exposure - There is no easier platform to work with to deliver viral results than Facebook. I have personally written dozens of posts that have reached hundreds of thousands of unique viewers within 48 hours of posting them. It doesn't matter what your topic is, there is a way to create a viral reach with your brand on Facebook. List Building - A well run page can double in size every three or four months. A page that hits the perfect note can double in size every few weeks. While there is a top end for every page, having a list of hundreds of thousands or even a million plus people who have 'Liked' your page gives you a pretty massive audience to share your message and offers with. Repeated Exposure - Facebook is a platform where people EXPECT you to be in touch with them multiple times a day. If you were to attempt this volume of communication over email you would find massive unsubscribes. Relationship Building - Facebook is the fastest way for people to get to know you. Facebook is not the place to hard sell people with, it's a place to develop rapport over time as people get a sense of the flavor of your message and brand. Facebook gives you a platform for people to become personally familiar and comfortable with who you are to the point where they will often engage in personal conversations, even go out of their way to share your page and make introductions of others to you. Global Network - It's a world wide platform. Facebook not only allows you to develop a network of potential clients, it connects you to a vast wealth of knowledge, relationships and support that is at your fingertips simply by sending out a message. Any city that you want to do an event in or get contacts or information about is instantly accessible. Validation - You know instantly when your message has connected. The kind of response and messages that people leave when something you post touches them is a great source of inspiration to keep doing what you're doing. People's lives are often touched in profound and significant ways on this platform. Market Research - You can gather instant feedback from your audience. Your followers will literally tell you what they want from you, often without you even doing a formal survey. How exceptional is it to have a direct line into the minds of exactly what the people you want to serve would like to pay you for than to be able to directly ask them? Networking - You're no more than a few degrees of separation from the entire online world. A healthy Facebook page gives you a special kind of credibility to be able to reach out to even those you have no common connection with. Simply by adding the URL to your Facebook page they can instantly see that you're a big deal in some way and be open to taking a moment to having an initial conversation. Media Clout - Anyone looking to see if you're an authority can instantly see your following. Whether you send out formal Media Releases or your Facebook page comes up in a search the media is doing when looking for an expert on a topic, having a strong following on Facebook gives instant credibility to the idea of your expertise on a topic. What is possible with Facebook is 5% weekly growth. That effectively doubles Facebook every 4 months and can be faster when when networked with other sources. A 30% conversion from Facebook to your email list is where to set your expectations which means that 1/3 new Facebook 'Likes' can be converted to your email list. Hopefully you know the monthly and lifetime value of an email signup to your list. You may very well see a virtually instant increase of over 1,000% or more. Many times posts I put together have a reach in the tens, even hundreds of thousands. 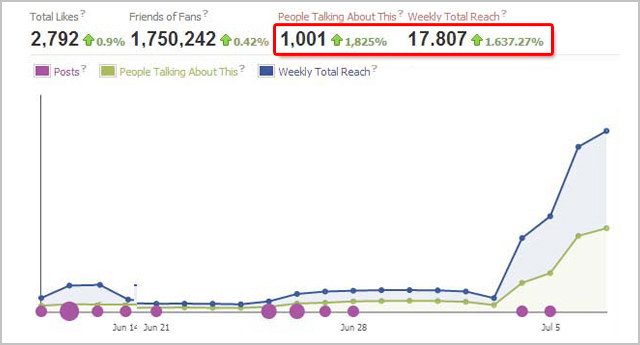 In the image below you can see how quickly well thought out posts can explode the reach of Facebook page. Facebook actually gives you a bigger and bigger bump when they notice that people are responding to posts on your page in a bigger way than before. The screen capture below is a client who we began posting for on June 25, 2013. The increase in Engaged Users rose from 20 to 1,200. That's an increase of 6000%!!! (all organic, no boost, advertising or requests to share it on other people's pages or networks). Some posts I've done have reached nearly 500,000 unique Facebook users (organic, no boost, advertising or requests to share it on other people's pages or networks). A single well executed technique can put you in front of literally hundreds of thousands of new eyes. Paying for the same exposure costs hundreds of dollars, but once you know the tone your audience responds to best you can accomplish this repeatedly at no cost. Best of all, this can all be accomplished WITHOUT having to rely on list sharing. This is a way to build your brand without feeling like you need to give away access to your own list to others in the group unless the offer is something you truly want to present them with. 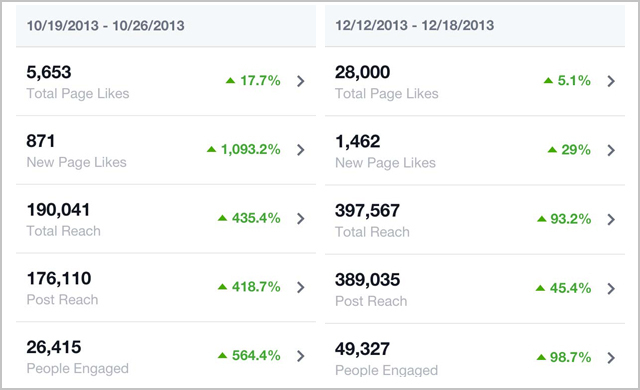 Do you know what Facebook charges to get the same kind of reach if you're not getting it organically? (You can always pay for reach, see below what it costs). Below is a screenshot of a Facebook page I took over for it's owner on June 24, 2013. Within three days and with just 4 posts the page began getting 1000% more exposure. This is 100% viral, nothing paid for, no 'tricks', just great content and knowing the secrets behind how Facebook rules are set up and delivering exactly what an audience wants (the key to effective ethical marketing). Many people I know have a few hundred, a few thousand - maybe even 10,000 fans, but virtually no one seeing posts from their page (ask around, it's getting tougher and tougher to have your content seen). The content you post and the energy you spend on Facebook is pretty much wasted if no one is seeing it or engaging with it. My best posts have been seen by half a million Facebook users (without me spending a dime, just friends sharing with friends). 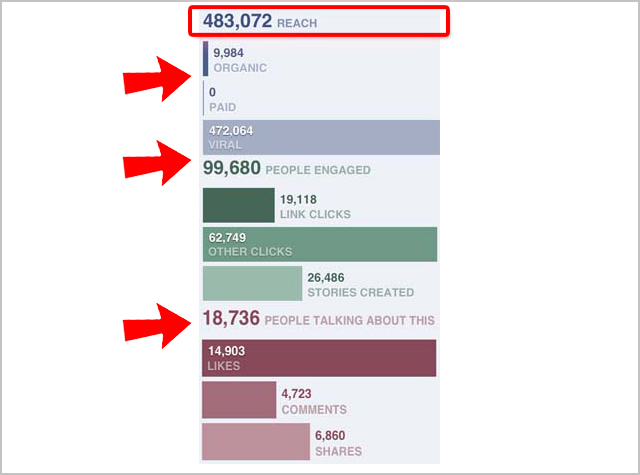 Below are the screen shots of the organic growth I began experiencing once I understood how to take good content and use it on Facebook in the most user friendly fashion. The numbers you're seeing are weekly results, meaning due only to the fact people liked and shared the content, HUNDREDS OF THOUSANDS of people see what I post every week! Consider that this same kind of exposure in your local paper, Google Pay Per Click, the radio, trade magazines etc. would literally cost you thousands and THOUSANDS of dollars. As you saw in the picture that shows you post boosting cost, I was able to get organic reach in a single post that Facebook otherwise would charge more than A THOUSAND dollars for if it weren't so engaging on its own. MORE THAN THE NUMBER OF PEOPLE WHO EVEN LIKE THE PAGE! Today my page grows at the rate of about 250 a DAY when I'm posting regularly and my single best post generated over 1,000 new followers! You Need More Than Page Likes: They Need to be Engaged! Most people are happy if their post is seen by 1,000 people. Recently one of my posts was seen by almost half a million people. That's 50,000% better than many people with Facebook pages are happy with (most posts barely reach 100 users because of FB rules you probably don't even know about). Engagement on Facebook is when people Like, Comment and Share your posts so that all of their 500 - 5,000 friends see it too. THAT'S what you want! GET 1,000 LIKES - FAST! Growing your Facebook page organically seems to be a big challenge for most people, but because I've worked on so many Fan Pages I know exactly what it takes to get a boost of 1,000 likes. The other day I shared a post of someone's on my page and their 'Likes' jumped by 300 in less than 24 hours. These are real people who have chosen to like and engage with a page, not 'bots' or fake profiles used to create the impression of interest. It's not enough to simply have people "like" your Facebook page, you want them to engage as well. Many Fan pages have thousands, even tens or hundreds of thousands of "likes" but only a tiny fraction of that number "talking about" the page. 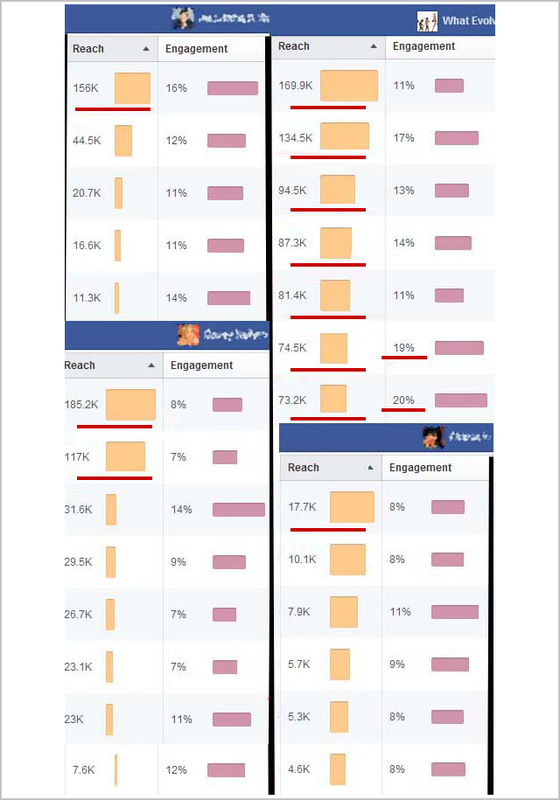 This means people aren't responding to the actual posts, or more likely - they aren't even SEEING the posts because Facebook sees low engagement as a reason not to share the majority of a pages post with those who have "liked" it. 7. How to increase your Facebook following of 10,000 or more fans without having to spend any time at all on Facebook. 8. All the admin basics that you need to set up the 50 components of your Fan Page correctly. 9. How to know if a post is going to go viral before you even post it. 10. 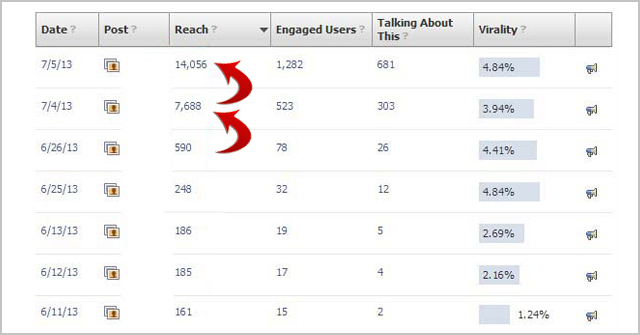 How to get other pages to share your content and increase your reach by 100,000 literally overnight. 1. Your best content re-purposed in articles, quotes and memes (those pictures you see with quotes on them). 2. Daily posts of both your content as well as viral posts for your specific audience to 'Like' and 'Share' and 'Comment' on. 3. Daily link back to a page on your site for list building purposes. 4. Connecting you with other pages to share your content on and give you additional exposure. 5. Training for you and/or your team to be able to take over the process for yourself if/when you determine you're ready to take over the platform for yourself. To inquire about Graphics, a Strategy Session or Facebook Fanpage Management, enter your information on the Contact page. 1. I show you the back end of my Facebook page. You'll see every post, every metric and have every detail explained. 2. I talk about the post that 500,000 people have seen and how I've taken that lesson and replicated it again and again. 3. I reveal how I choose the pictures I use that make people want to step and read what I post, pictures virtually no one has seen before. 4. I share my 'secret weapon' and page admin details with you, revealing who has taught me all the rules about Facebook that I didn't know. 5. I go through the Facebook page that I just took over and describe exactly what I did to increase its reach by an explosive 1000% in just a few days. There's a lot more, but I'll just say that it's 90 minutes filled with so much value you're going to feel like you received a Masters Degree in Facebook that you'll be able to immediately implement when the 90 minutes is done. ***GET THE FACEBOOK WEBINAR DOWNLOAD NOW Just $37.